The scramble to make Siri-like apps, tweaks and plugins for not just the iOS devices, but anything with a speaker and an internet connection, has seen quite a few possible solutions pop up across both the App Store and the jailbreak store, Cydia. So far, none have really come close to either replicating the functionality of Siri, or offering something different but actually works. A new contender has entered the arena, called ESRA, and it is available for jailbroken iOS devices via that home of all things jailbreak, Cydia under the BigBoss repo. The name ESRA actually stands for ‘Experimental Speech Response Application’, and that should probably give you an idea as to how well the app actually works. Put simply, it really doesn’t. While ESRA tries to offer Siri-like functions and features for devices that are not the iPhone 4S, it unfortunately does not have the power of Siri’s real language recognition behind it. What that leads to is plenty of instances where the app just does not know what you have said, leading to incorrect searches or ESRA simply not knowing what to do. Now granted, we’ve had that happen with Siri on a few occasions too, but when Siri works it is like magic. ESRA, not so much. Of course, it is indeed worth remembering that the clue is in the name, and with ESRA currently in very early development it is perhaps a little harsh to compare it to Siri, something that began life as an application that had plenty of work go into it. 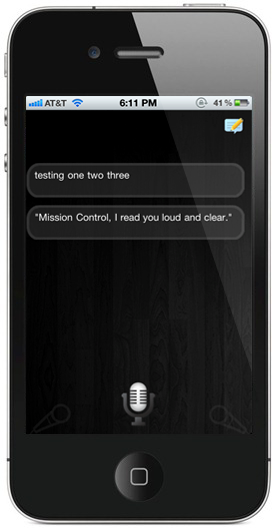 Siri then benefited from everything Apple could throw at it before being made a prime feature of the iPhone 4S. ESRA has not had the benefit of all that, so we’ll cut it a little slack for now. What ESRA does show is the insatiable appetite people seem to have for voice recognition and anything that will act upon spoken commands, just like Siri. We were skeptical that people would really want to talk to their smartphones, but it seems that they may actually want to do just that. If Apple really is working on a Siri-enabled television, then maybe they are onto something after all!